The types of bees in the garden helping with pollination chores, a popular topic of conversation among gardeners, usually starts and ends with the family Apidae. Potentially the conversation can last for days because North American hosts approximately one thousand different Apidae species, including its most familiar members, honey bees and bumblebees, along with less familiar names such as Cuckoo Bees, Carpenter Bees and Digger Bees. The video clip shows a digger bee as well as what looks to be a leaf cutter bee. 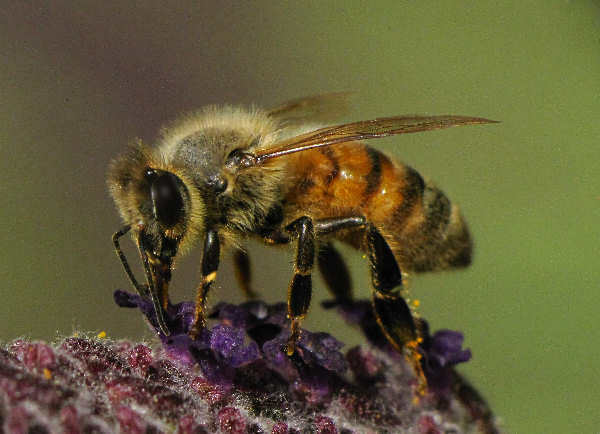 Both types of bees help pollinate gardens. Going back to the Apidae bees, it needs to be noted that they rank as star pollinators of backyard gardens and large scale agricultural enterprises. Because they tend to be general pollinators, honeybees hold a special place in the commercial agricultural sector. The largest number of fruits (1414 tomatoes) and the heaviest and largest tomatoes, and the ones with the most seeds were collected from the greenhouse with the stingless bees…. The stingless bee, M. quadrifasciata, was significantly more efficient than honey bees in pollinating greenhouse tomatoes. Many kinds of bees tend to be either specialist pollinators or general pollinators. Squash bees, for example, are always a welcome visitors to gardens that plant any member of the cucurbit family. Specialist native bees not only help in the garden, they also help by contributing to native flora diversity. The article introduces some representative species of bees in the Apidae family, along with providing a close up video presentation of a couple of bee species. For the real bee enthusiast, feel free to press a button to discover more wonders of the bee world. Like honeybees, native bumblebee (genus Bombus) populations continue to experience population stress, to one degree or another. Franklin’s Bumblebee (Bombus franklini), a native species of Southern Oregon and Northern California, for example, is listed as critically endangered on the IUCN Red List. Population declines of other native species are also being recorded around the world. Researchers hypothesize that the introduction of non-native species into the commercial market solely for pollination, also introduced the diseases associated with the commercial bumblebees. 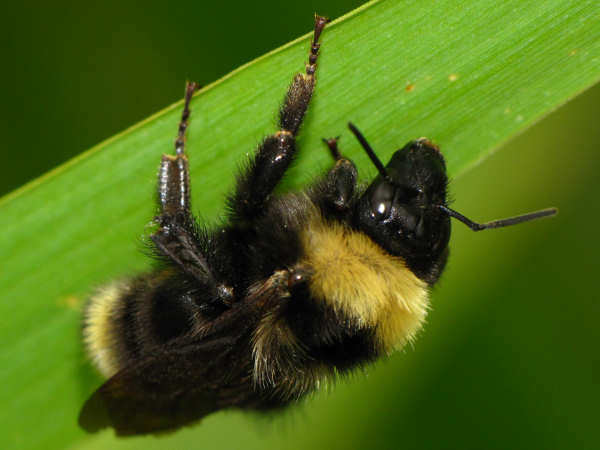 As the commercial bumblebees escaped into the wild, the mites and viruses associated with them began afflicting native bumblebee populations. Increased pesticide use and habitat alteration which reduces the number of native flowering plants associated with native bumblebee species also contributes to bumblebee population stress. Currently experts count some 46 different types of bumblebee species present in North America. The picture shows a Californai Bumblebee. To learn more about identifying bumblees, press the button. 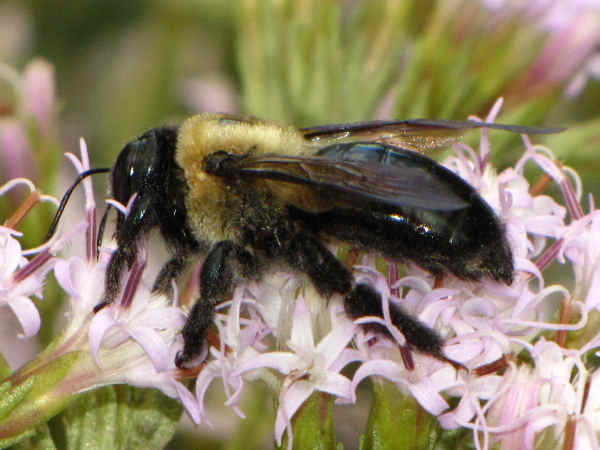 The Eastern Carpenter Bee (Xylocopa virginica) looks like an over sized version of a bumblebee without a hairy abdomen. Its range extends through most of the eastern half of the United States. Like bumblebees, they are social insects that spend their day pollinating flowers. Experts from Texas A&M University describe Carpenter Bees as follows. As the name suggests they build their nest in wood, which occasionally causes problems in residential areas. A circular hole on the surface of untreated wood, along with a trail of sawdust, are typical indications of carpenter bee activity. The best way to deal with carpenter bee problems in the home is to discourage them by insuring exterior wood areas such as siding and fences, are either painted or treated with a wood preservative. 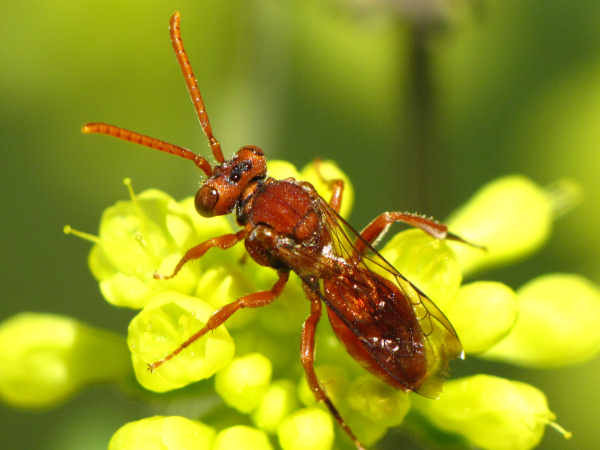 Hairless and small in size, Cuckoo Bees family resemble wasps more than they resemble bees, making them among the least known of the family (Apidae). The common name cuckoo refers to the bee’s practice of brood parasitism, like it’s namesake in the bird world, the Cuckoo bird. Adults lay their eggs in ground nests of other bee species, and then let the young fend for themselves. Their practice of building nests in soil explains the common name for a large groups of bees in the family Apidae. 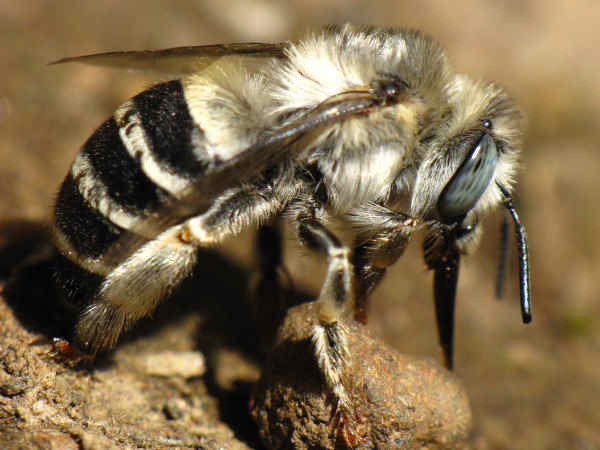 The picture shows a blue-eyed Digger Bee. Generally speaking, digger bees are not known to be aggressive bees, thereby reducing the need to remove any nesting sites that may appear in the backyard or near the garden.